The world premiere of “Dolores” was impeccably timed. The documentary about 87-year-old activist extraordinaire Dolores C. Huerta debuted at the Sundance Film Festival on Jan. 20, the night before women across the world marched for equality and human rights. Huerta was at a protest, too. Where else would she be? In Park City, Utah, she spoke at a rally following a march organized by Chelsea Handler. Huerta led a chant of “sí se puede” — Spanish for “yes you can,” a catchphrase that was Huerta’s long before Barack Obama made “yes, we can” his own. For many in the crowd, this might have been their first taste of public demonstration. Huerta has been doing it for seven decades. 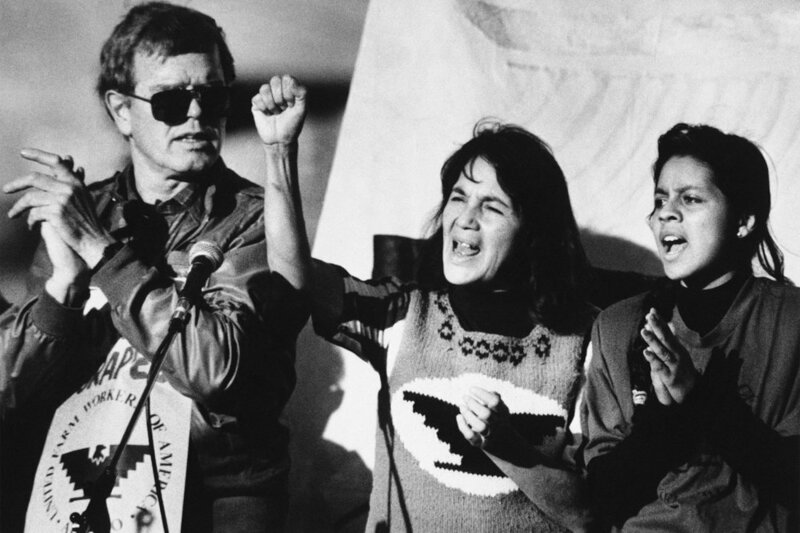 The president and founder of the Dolores Huerta Foundation rose to prominence after co-founding the United Farm Workers of America with Cesar Chavez in 1962. The documentary, directed by Peter Bratt, which expands its release to Washington and other cities Friday, looks at the life of a woman who fought for migrant workers, then turned her attention to immigrants, women, minorities and other marginalized groups. Through it all, Huerta was marginalized, too. While the late Chavez has streets, statues and a holiday named in his honor, Huerta hasn’t gotten the same recognition. Still, Huerta hasn’t slowed down even as she approaches 90. During a recent visit to Washington, D.C., with Bratt she was bright-eyed and quick-witted, giving a rapid-fire list of her foundation’s recent victories. She showed off the kind of memory that would make someone half her age jealous, throwing out all the names of “the martyrs” who died for the farmworkers movement, not to mention the people inspired by her foundation to get involved in local politics. In some ways, her documentary is a blueprint for getting things done, which might come in handy for those in the #resistance. In that case, she has a few lessons for how activism is like a special power. “It’s like having a magic wand,” she said. For Chavez and Huerta, it all started with house meetings — organizing farmworkers to join the fight against harsh treatment, gaining the trust and solidarity to arrange the pivotal Delano grape strike in 1965. Huerta and Chavez decided the only way to help those toiling for long hours with meager pay was to live among them. So Huerta lived with her 11 children (four of whom were the product of a long-term relationship with Chavez’s brother, Richard) in poverty with the people she aimed to assist. No one said #resisting was easy. Huerta endured sexism from outside the labor movement as well as within it. Her opponents tried to shame her for having so many kids — some out of wedlock — and for the fact that she wasn’t at home taking care of them. In one telling archival interview in the documentary, a female reporter asks Huerta what she would do if someone gave her $5,000 to spend on herself. Huerta responds that she’d donate it to the movement. “But don’t you ever have the average woman’s dream of going out to some spa and being relaxed and having a new hairdo and buying a great dress and having a big party?” the reporter asks. A young Huerta laughs gamely; she’s clearly heard this kind of question before. “To me, being at a spa and having a new hairdo would be a terrible waste of time,” she says with a smile. In some ways, activism has changed over the years thanks to the Internet. Huerta credits social media for getting tens of thousands to take to the streets of Boston in August to protest a rally that had echoes of the white nationalist march in Charlottesville a week earlier that left three dead. And yet, the Internet can do only so much. “What I learned from Dolores is nothing replaces the one-on-one in-person house meeting where you’re actually interacting with community members,” Bratt said. Huerta, meanwhile, stresses that no tweet is as powerful as a vote — and that includes voting in local races. She’s been banging this drum for nearly her whole life, and yet even she has to admit that the documentary comes at an auspicious moment. Bratt figured the story would hit home for some viewers, particularly people of color. The director, whose Quechua mother grew up in Peru, knew that, no matter how “post-racial” Americans claimed to be after Obama’s inauguration, racism never really went away. He didn’t predict how much it would speak to all Americans, though — particularly those horrified by white nationalists marching in Charlottesville. In 2017, not only is “Dolores” a reminder of what U.S. citizens have the power to do, it’s also a testament to who they are.